You might be wondering why you need to hire professional carpet cleaners when you can get your carpet cleaned on your own. Homeowners mostly perform vacuum cleaning to get rid of dent and dirt buildup in carpets. But being your own carpet cleaner with these methods is not enough. Carpets need more attention than what they are given, so you need to get your carpet cleaned professionally. You need to turn to a carpet cleaner when your carpet has already flattened. It is expected that carpets get a lot of foot traffic, which could press their fibers down. Yes, you can be your own carpet cleaner by vacuuming and brushing the fibers, but you might just end up considering buying a new carpet or having cold tile flooring instead. Before you do any of that, you might want to get your carpet cleaned by professional carpet cleaners first. Having your carpet cleaned professionally can help fluff it back up to its original state. Professional carpet cleaners follow a professional carpet cleaning process that completely removes dirt, dust, and bacteria buildup in carpets. When these particles are removed, your carpet will regain its fluffiness. You need to contact a carpet cleaner when you notice a reappearing stain. Getting tough stains out of carpets can be a daunting task without the help of professional carpet cleaners. Typically, you will try to clean the stain hoping that would do the trick even without employing professional carpet cleaning services. The stain might disappear, but it might soon reappear after a few days if you do not get the carpet cleaned professionally. You must hire carpet cleaning professionals when you notice a reappearing stain. Professional carpet cleaners use treatments and chemicals intended for carpet cleaning in Colorado Springs. You need to call a carpet cleaner when you see a reappearing spot. It is also high time for you to get your carpet cleaned professionally when a spot seems to reappear on your carpet even after vacuuming it. It might disappear eventually, but without the help of a professional cleaner, it can show up again and be larger than it was. You can save yourself a lot of trouble if you leave this problem to professional carpet cleaners. You need to get in touch with a carpet cleaner when your carpet already has a stale smell. 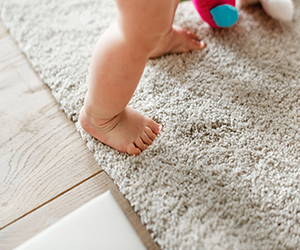 Do you remember the last time you gave your carpet a smell check? Professional carpet cleaners can confirm that pet odor is the worst contaminant carpets can get. Plain cleaning cannot remove this foul odor, so you need to get your carpet cleaned professionally. Colorado Springs’s carpet cleaning service will do a great job of removing dust buildup and pet contamination. Professional carpet cleaners perform an on-site inspection before employing the most fitting method in cleaning carpets. They also check the backing system of carpets to see how bad the contamination is. Our team of professional carpet cleaners can help you get rid of these signs and get your carpet cleaned professionally. We provide homeowners and business owners in Colorado Springs with quality, professional carpet cleaning services. In addition, we take pride in our carpet cleaning professionals’ honesty, integrity, and frankness when recommending methods to get your carpet cleaned. Learn more about why you should hire a professional carpet cleaner for your upholstery and Colorado Springs carpet cleaning needs. Let Our Professionals Assist You! You can expect the employees of Carpet Care Craftsman to deliver nothing but high-quality services and exceptional results. If you place your confidence and trust in our professional carpet cleaners, we will not only get your carpet cleaned professionally but also help you keep it clean and well maintained. So, if and when you see the above mentioned signs, reach out to our Colorado Springs’s carpet cleaning business, and our professional carpet cleaners will address your problems with your carpets as soon as possible. Click here to view our recent newsletters about our professional carpet cleaning services and cleaning in Colorado Springs.